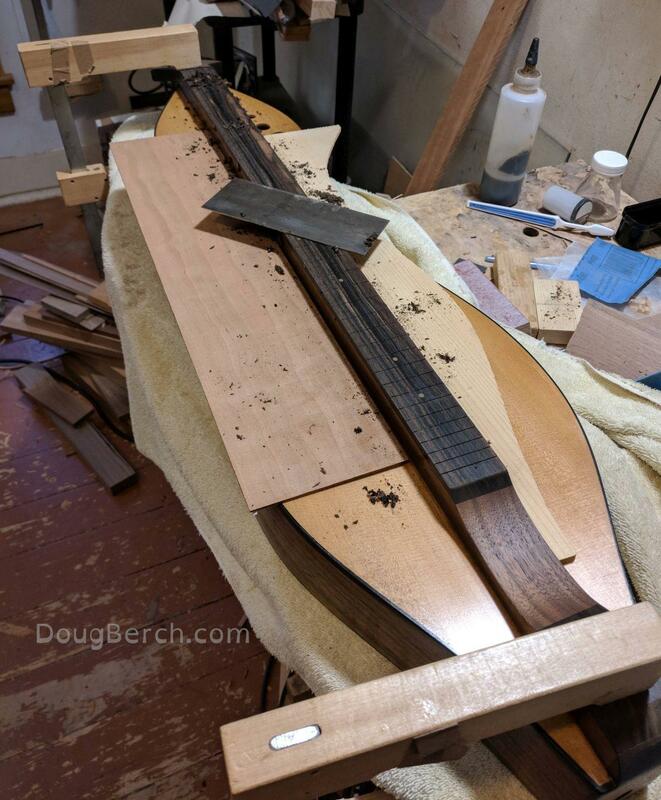 Last night I realized this blog started in 2007 when I returned to dulcimer making following a 25 year detour. Since then my dulcimer designs and methods of work have continually evolved and this shows no sign of changing. This makes me happy! As I continue to learn and develop skill with hand tools I am drawn deeper into older methods of work. Shaping wood with sharp tools appeals to me and I find comfort in knowing that if the power goes out I will still be able to work! In the photograph above I have just finished shaping a spruce back brace. The shaping began with a low-angle block plane, then a finger plane, and finally a scraper. The next step will be tapering the ends of the brace with a chisel and fitting them into the side kerfing. There was a time I felt obligated to sand back braces because I worried some imaginary person might think my braces looked rough because I “skipped” sanding them. Lately I think differently; I see the small facets on the brace that show I shaped them with edge tools. I see the slight irregularities edge tools leave behind. I see that I had been there and I had done something. Again, this makes me happy. None of this means I will never sand braces again. It means I like following my intuition and inspiration. Creativity is never static. On the bench today is a custom chromatic dulcimer with an ebony fingerboard. The spruce soundboard has been stained and lightly distressed to add some character. I’m a character and so are my dulcimers. So it goes. Many dulcimer makers fret the fingerboard early in the construction process. It is much easier to install the frets when the fingerboard is separate from the dulcimer; one can hammer or press the frets in without any thought of possibly crushing the dulcimer beneath them! I know several dulcimer makers who get good results fretting the fingerboard before gluing it to the dulcimer but I prefer fretting the fingerboard after assembling the dulcimer and applying the finish. Experience has shown me that applying the finish to a dulcimer sometimes results in slight movement of the soundboard and fingerboard. By fretting after applying the finish I can level and/or add relief to the fingerboard and have it come out exactly as I prefer it to be. 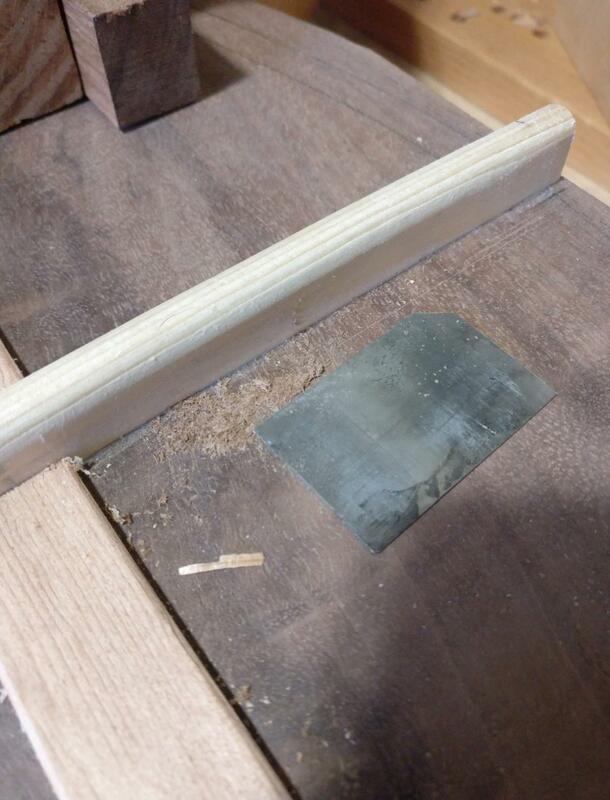 I use a scraper and a few sanding blocks to prepare the fingerboard for fretting. The scraps of wood lying on the dulcimer prevent bad, scary things from happening to the soundboard while working on the fingerboard. The movement of the fingerboard and the correction I am talking about is measured in thousandths of an inch. As a player I find these small increments can make a surprising difference in how much I enjoy playing a dulcimer. Fretting towards the end of a build requires more work but I am often told my dulcimers are very comfortable and easy to play and this is a part of how I make them that way. Today I did a little work in the shop for the first time since having back surgery on February 5th. It was wonderful being in the shop again! I did some work on a curly walnut dulcimer that was left close to completion in February. I leveled, crowned, and polished the frets and started working on the nut. This was gentle work with small tools but after about half an hour my body told me it was in my best interest to stop and to my amazement and surprise I listened! Slow and steady wins the race. A stitch in time has a silver lining. A dark cloud gathers no moss. I’ll stop now. It will be a month or so before I can begin to work in the shop part-time with some regularity. My body is healing well but there is still a long way to go. In the photograph is a small piece of micarta that will become the nut for this dulcimer. 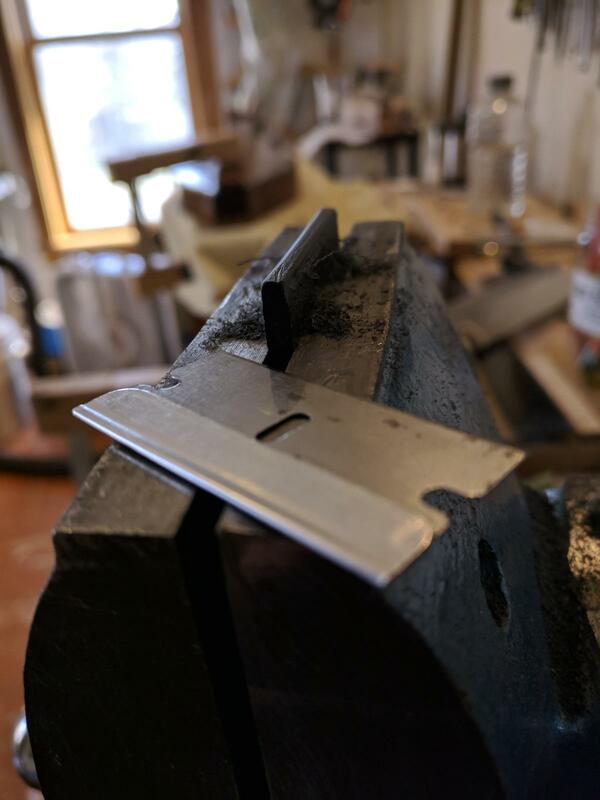 I use the indentation in the side of a razor blade as a scraper to rough in the rounding of the top of the nut. Add this to the long list of cheap luthier tricks! That’s the news from here.